Read the fascinating story of Grace Kimmins, from her social work in the Bermondsey slums in the 1890s, the founding of her unique craft school for disabled boys in Chailey, Sussex in 1903, through two World Wars, to the takeover of Chailey Heritage by the NHS in 1948. My talk at Waterstones in Haywards Heath last Friday went well, with a lively audience, many of whom had personal knowledge of Chailey Heritage. Particular thanks to the couple who brought along some fascinating Chailey memorabilia. If you happen to read this, please could you contact me by email as I seem to have mislaid your email address. Many thanks. With the current fascination in all things pertaining to women’s suffrage, there was interest in Grace’s friendship with leading figures in both the suffragette and suffragist movements. I’m delighted to be giving a talk about my latest book Grace Kimmins and her Chailey Heritage at my local Waterstones this Friday. Special thanks to the manager, James, for hosting this. I’m hoping the bad weather doesn’t deter people from coming along and finding out more about a pioneering local woman who made a big impact on the national stage. Grace Kimmins – Suffragette or Suffragist? Before Grace set up her craft school for disabled boys at Chailey, in Sussex, in 1903, she had been working as a Sister of the People at the West London Mission and then at the Bermondsey Settlement. Amongst her fellow Sisters was Emmeline Pethick who would go on to become a very active suffragette, even suffering the indignity of force-feeding. A leading supporter of the West London Mission was Lady Henry Somerset, temperance leader and suffrage campaigner. But Lady Henry was not in favour of the violent protests of the suffragettes and aligned herself with the suffragists, believing that reasoned argument was a more effective tool. Millicent Fawcett, suffragist leader, was also amongst Grace’s friends. When Grace set up her Guild of the Brave Poor Things for disabled adults and children, both Lady Henry Somerset and Millicent Fawcett were on the founding committee. Grace clearly believed that women had an important part to play in society and actively campaigned in support of Sisters who were standing for office as Guardians of the Poor. She appears to have told her family that she could have been a suffragette. She certainly liked theatrical gestures. But instead, she put her main energies into her social work with the poor and disadvantaged and became a pioneer of special education. As we enter 2018, we will be hearing a lot more about women’s fight for political equality, celebrating 100 years since females were allowed to vote. Most of the women I have written about have strong links to the campaigns for women’s suffrage. For much of their lives, these women had no vote and so little political power, but that didn’t stop ‘my ladies’ (as I think of them) making a significant impact in the world. Take Agnes Weston (featured in Scandal Salvation and Suffrage – the Amazing Women of the Temperance Movement). She lived openly with another woman, Sophia Wintz, and, in recognition of all the work she had done for sailors, she was the first woman to be granted a funeral with full naval honours. Lady Henry Somerset was a staunch campaigner for women’s suffrage although she was not a militant. She was a suffragist who believed in the power of reasoned argument and often addressed meetings on the subject. She upset many of the Executive Council members of the British Women’s Temperance Movement (BWTA) by wishing to include suffrage as a major issue in the association’s work. This led to a split in the ranks. It wasn’t that the her opponents didn’t want women to get the vote; it was because they thought this wasn’t an issue in which the BWTA should get involved. So they set up The Total Abstinence Union to campaign solely on the temperance issue and Lady Henry steered the newly named National British Women’s Temperance Union to include many women’s issues, including suffrage, in its agenda. Grace Kimmins and her Chailey Heritage. By Ros Black. Even with my close association with the Heritage Craft Schools in my formative years at Chailey and a personal knowledge of Grace Kimmins, later Dame, I found this book to be deeply moving. I am not what you might call an original thinker so as a child at the Heritage I never gave the origins of Chailey a second thought, nor for that matter did I ever consider the Commandant, as Dame Grace was called, to be out of the ordinary, apart that is, from her personal choice of dress. 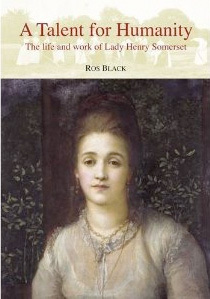 However as I have learned from this extremely well researched book she was indeed an extraordinary woman with a profound social conscience, a person who carried her sincere beliefs throughout her life, and whose achievements would be nigh impossible to fulfil today, indeed it would be difficult for any such person to raise the vast amount of resources that she did in her lifetime. From a nondescript start in life her successes came about because she pricked the conscience of high society and the wealthy to the plight of poor disabled children in the slums of London, she was able to gather around her many influential and philanthropic women with similar visions as her own, none more so than Princess Louise the daughter of Queen Victoria who became an ardent patron, I can’t imagine any woman with a similar background to Grace Kimmins attracting the patronage of the Royal Family today, which was so vital to her cause. I found the description of the autumn years of Dame Grace’s life utterly moving; it seemed that after a pioneering lifetime of one struggle after another it was beginning to disintegrate around her; it was undoubtedly heartbreaking for her to lose her lifelong friend and supporter Alice Rennie, she had been with Grace from her early days, this was followed later with the loss of her husband Charles who was inspirational in the field of education. With these two pillars of strength missing from her life Grace still had the tangible highpoints of her achievements surrounding her; prominent amongst them was St Georges the residential home for 150 disabled children, followed by St Martin’s hospital and the magnificent chapel that gladdens the eye and of course St Helen’s Heritage for disabled girls. But circumstances beyond her control were yet to deliver another blow to Grace, when at the pinnacle of her success, she witnessed the formation in 1948 of the NHS, but sadly with its creation she was to lose the pivotal raison d’etre of her very being, and reluctantly she had no option but to stand aside and allow the prestigious management of her beloved Heritage Craft Schools be taken from her. Despite her declining years and this bitter episode in her life Grace continued to take a keen interest in the welfare of Chailey, but after 45 years of humanitarian giving this time it was to be from the sideline. Dame Grace’s life had been one driven by compassion and caring for others; she was a visionary who wanted to give opportunities to the disabled and less fortunate, starting with the deprived and poor children from the slums of London and finishing with a world-renowned medical and educational facility in the heart of the Sussex countryside, one that was shaped around the needs of severely disabled children and war injured soldiers. It was an achievement of a simple woman but one of greatness. This book is a good read and hard to put down until the end is reached. It has 208 pages and is well illustrated and at only £10 with profits going to the Chailey Heritage Trust it is thoroughly recommended. J.H. Most of the Chailey Heritage archives are kept at The Keep so, when researching my book, I spent many happy days there looking at old files and photographs. The staff were very patient with all my requests. I shall be giving a talk at The Keep on 31st October on Grace Kimmins and her Chailey Heritage. The new book was well received at the launch at Chailey Heritage on 12th October. It was lovely to meet up with some former Chailey pupils who have been so helpful to me in my researches. “Very readable and very well-judged – I like it very much” – Graham Taylor, historian and biographer of Ada Salter, Grace’s flatmate in Bermondsey.